Catherine Elizabeth Newman (born 14 July 1974) is an English journalist and presenter of Channel 4 News. Newman began her career as a newspaper journalist, and had spells at Media Week, The Independent, the Financial Times and The Washington Post. She has worked on Channel 4 News since 2006, initially as a correspondent and, since 2011, as a presenter. Born in Guildford, Surrey, Newman is the younger daughter of David Newman and his wife Julia Worsdall, both chemistry teachers, and has one sister. At the age of 16 she joined Charterhouse, where her father taught, as one of a few girls admitted to the school's sixth form. She has said that she stayed silent for years about the sexual harassment and other humiliation she experienced from fellow pupils. She was on the path to a career as a violinist or in the legal profession before changing her plans as a result of seeing BBC journalist Kate Adie on television. Newman read English at Lady Margaret Hall, Oxford, where she graduated with first-class honours. After university, Newman briefly worked on The Guardian' Books section, then at Media Week (as a trainee) and The Independent (as media business correspondent) before joining the Financial Times at the age of 23. Her older colleague Alice Rawsthorn acted as a mentor at the FT, where Newman worked as a media and then (for three years) political correspondent. While Newman was working at the FT, David Yelland, the editor of The Sun, offered her a slot called "Better than Lex" (named after Lex, a column in the Financial Times). She seriously considered the offer, but later declined; the experience led to further opportunities in political journalism. Newman began a television career in 2000. She gained a Laurence Stern fellowship to work at The Washington Post for four months. During her period in the US, she followed the 2000 Presidential campaign of Green Party candidate Ralph Nader. She joined Channel 4 News in January 2006 as a political correspondent and deputy to political editor Gary Gibbon. In this role she broke several stories, including claims the Treasury pushed through the nomination of then Chancellor Gordon Brown's close friend Ronald Cohen for the House of Lords, challenging Peter Mandelson at the Brighton Labour Party conference in 2009, over his claimed use of the "c" word in a conversation with Rebekah Brooks (née Wade), the CEO of News International). Alongside this, she has also headed the team behind the FactCheck blog. From 2013 to 2015, Newman's pursuit of a story about the allegations of improper conduct levelled at Lord Rennard, once a leading figure in the Liberal Democrats, included her participation in an LBC local London radio phone-in on 27 February 2013 to quiz deputy Prime Minister Nick Clegg on the issue. Newman has commented that sexism was endemic at Westminster during her period as a lobby correspondent there, but has also said that the newspaper industry is even worse. She told Natasha Lunn in an interview for Red magazine in 2016: "As a woman in the media I feel a duty to make sure we report those issues. I’ve always wanted to right injustices; I suppose what’s changed is I’ve now got a keener sense of how journalists can hold power to account". The victim of online sexism for her work, Newman gave her support for "public shaming" of trolls in 2013: "the best way to tackle these people is to publicly humiliate them". A regular commentator on politics in other media outlets, Newman has appeared as a guest panelist on Have I Got News for You and blogs for The Daily Telegraph and Economia magazine. Newman was long-listed for the Orwell Prize (Journalism) in 2010 and again in 2011 for the blog prize. She was announced as one of the judges for the Baileys Women's Prize for Fiction in 2015. Her book, Bloody Brilliant Women, concerning significant, but unheralded, 20th-century women, is due for publication in autumn 2018. In January 2018, Newman interviewed the Canadian psychologist and professor of psychology Jordan Peterson, who is known for his criticism of political correctness. The combative interview covered topics such as gender equality, including the gender pay gap, freedom of speech, and transgender rights. The interview became a viral phenomenon on YouTube, where many commenters were critical of Newman, several of them saying she had a preconceived and misplaced grasp of Peterson's views. The New York Times columnist David Brooks said that Newman had "distorted, simplified and restated Peterson's views to make them appear offensive and cartoonish". Channel 4 News editor Ben de Pear said that the station had called in security specialists in response to social-media abuse and threats directed against her. She later told The Guardian that the abuse had included death threats. Peterson asked his Twitter followers not to threaten her and to be civilised in their criticism. In February 2015, Newman tweeted that she was "ushered onto the street" for being female when she went to South London Islamic Centre for a 'Visit My Mosque' programme. The mosque started receiving violent threats from the public as the story spread. A spokesperson for the Hyderi Islamic Centre had said Newman had simply visited the wrong address, and CCTV footage showed Newman had left the building on her own accord. Newman and Channel 4 News editor Ben de Pear later apologised, acknowledging that Newman had mistakenly visited the wrong building. Newman married writer John O'Connell, whom she met at university, in 2001. The couple have two daughters and live in London. Newman has written about having a miscarriage, and about deciding to abort another child, after discovering 13 weeks into her pregnancy that the baby had a very rare condition which meant there was a high chance that it would die. ^ a b "Newman, Cathy". WHO'S WHO and WHO WAS WHO. A&C Black. 2018. doi:10.1093/ww/9780199540884.001.0001/ww-9780199540884-e-249479. 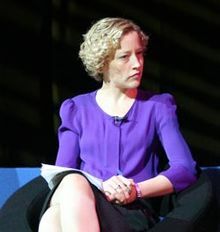 ^ Lisa Campbell "Cathy Newman, C4 News", Broadcast, 20 October 2011. Newman's date of birth is given as "Bastille Day 1974". ^ a b c Iqbal, Nosheen (19 March 2018). "Cathy Newman: 'The internet is being written by men with an agenda'". The Guardian. Retrieved 19 March 2018. ^ "Index entry". FreeBMD. ONS. Retrieved 17 January 2018. ^ Quinn, Ben (2 September 2018). "Cathy Newman says she was sexually harassed at elite school". The Guardian. Retrieved 2018-09-22. ^ a b c d e Burrell, Ian (18 May 2014). "Channel 4 newsreader Cathy Newman doesn't just read the news – she makes it". The Independent. ^ a b "Cathy Newman – News and Current Affairs". Knight Ayton Management. Retrieved 19 March 2018. ^ "Nader Picks a Milder Shade of Green". Common Dreams (reproduced from Washington Post). Archived from the original on 23 September 2015. Retrieved 15 August 2015. ^ "Brown honour nomination 'normal'". BBC News. ^ "Did Mandelson use the 'chump' word?". Channel 4 News. 30 September 2015. Retrieved 14 October 2015. ^ Elgot, Jessica (27 February 2013). "Lord Rennard Allegations: Channel 4 Cathy Newman Calls Clegg Phone-In". Huffington Post. Retrieved 15 August 2015. ^ Newman, Cathy (27 February 2013). "Lord Rennard row: Nick Clegg called to account by Cathy Newman". The Guardian. Retrieved 15 August 2015. ^ O'Carroll, Lisa. "Cathy Newman claims to have been propositioned at political conference". The Guardian. Retrieved 15 August 2015. ^ Lunn, Natasha (30 November 2016). "An Interview With News Presenter Cathy Newman". Red. Retrieved 30 November 2016. ^ Mesure, Susie (19 July 2013). "Channel 4 newsreader Cathy Newman says public humiliation is the answer for sexist remarks". The Independent. Retrieved 21 January 2018. ^ "Have I Got News For You Series 46 Episode 1 of 11". BBC. Retrieved 15 August 2015. ^ "Baileys women's prize for fiction shortlists debut alongside star names". The Guardian. Retrieved 10 May 2015. ^ Saul, Hreather (8 March 2018). "17 bloody brilliant women (and two men) share their proudest moments for International Women's Day". i. Retrieved 19 March 2018. ^ a b Harley, Nicola (2018). "Channel 4 News calls in security experts after trolls make 'vicious' threats to presenter Cathy Newman". The Telegraph. ^ a b Khan, Shehab; Sharman, Jon; Pasha-Robinson, Lucy (20 January 2018). "Cathy Newman: Channel 4 calls in security experts following 'vicious abuse' over Jordan Peterson interview". The Independent. ^ a b Likhodi, Lidia (29 January 2018). "British journalist subject to online threats following interview with Jordan Peterson". The Varsity. Retrieved 2 February 2018. ^ Doward, Jamie (21 January 2018). "'Back off', controversial professor urges critics of C4 interviewer". The Observer. Retrieved 21 January 2018. ^ a b "Security for British TV personality bolstered after interview with Jordan Peterson". Toronto Star. Canadian Press. 2 January 2018. Retrieved 19 March 2018. ^ Brooks, David. "The Jordan Peterson Moment". The New York Times. The New York Times Company. Retrieved 18 May 2018. ^ Ruddick, Graham (19 January 2018). "Channel 4 calls in security experts after Cathy Newman suffers online abuse". The Guardian. Retrieved 19 January 2018. ^ Gillespie, James (21 January 2018). "Channel 4's Cathy Newman trolled over gender pay gap". The Times. London. Retrieved 1 February 2018. ^ a b "Channel 4's Cathy Newman apologises for 'misunderstanding' over mosque". The Guardian. 6 February 2015. ^ Johnston, Ian (2 February 2015). "'Mix-up, not sexism' as Channel 4 presenter Cathy Newman is turned away from a mosque on 'Visit My Mosque Day'". The Independent. Retrieved 26 January 2016. ^ "Channel 4's Cathy Newman Apologises After CCTV Footage Emerges Of Mosque Incident". The Huffington Post (UK). 6 February 2015. ^ "Channel 4 presenter Cathy Newman sorry over mosque claims". BBC. 12 February 2015. ^ Urwin, Urwin (21 July 2017). "Cathy Newman is on a mission to stamp out FGM". London Evening Standard. Retrieved 24 January 2018. ^ Newman, Cathy (2 October 2012). "Cathy Newman: how the agony of my abortion made me see both sides". The Daily Telegraph. Retrieved 10 May 2015.